I Am Momma - Hear Me Roar: Soapbox Saturday - Petite Lemon Prints and a GIVEAWAY! Soapbox Saturday - Petite Lemon Prints and a GIVEAWAY! Today I get to introduce you to a beautiful shop - Petite Lemon Prints. They make the prettiest things, ranging from growth charts, posters, stationary, and a while lot more. Not only are they great for decorating your own home, but all of the products also make awesome gift ideas. Let's take a peek. Not only is this print darling, but it's so cool to have it personalized. What little girl wouldn't love this hung above her bed? So cute. I love growth charts and these ones are so fun. You find Petite Lemon on Facebook HERE. You can even receive discounts by signing up for the email list on their web site HERE. Today Petite Lemon is giving away a $50 Petite Lemon gift card, good for any growth charts, alphabet posters, or photo posters (not valid for stationary or invitations). Just leave a ONE comment to enter. Giveaway ends Wednesday. What a cute company! I am a sucker for kids room decor since having my son! Great giveaway. I love the girly frame! I love growth charts too! Such cute stuff. i love this alphabet! so cute! Very cute growth charts...you are right, they would make nice gifts. Thanks, Cheri! This is my first time commenting - I love your blog! These growth charts are adorable and would look so cute in my little girl's bedroom! I love the growth charts and alphabet! Adorable! Thanks for the chance to win! I would love one of those growth charts! Love the alphabet I have a thing for lettering. fun giveaway! Super cute! I love the growth charts and would be thrilled to have one for my son (almost 2 and growing like a weed). Thanks for the opportunity! I love the alphabet poster. I would love to have one made for my son, Leif Alexander! Adorable. I want the alphabet print! oh, yes, YES, please!!! I adore alphabet charts. Thank you so much for the link to a new store and the chance to win! I love the modern style, and the alphabet is fantastic! crossing my fingers! So adorable! I want a growth chart! Oh, I've been wanting a growth chart for our daughter! so very cute! would love to win! All of it is so adorable! How cute! I love that the U has a unicorn and not an umbrella! I wish the D had a dragon also! Love it!!! So stinkin cute!! They are adorable!!! Fingers crossed! What a cute shop! My sister is expecting in December and any one of these prints would be perfect! Cute! I love the photo posters. thanks for such a great giveaway!! love all the stuff in her shop! How fun are those growth charts! I would love to have one of those for my son, he's just one year! Perfect time to start! Thanks for hosting a give away! Oooooh sooo much to choose from! Thanks for the giveaway! So cute! Would love to win. I love the personalized ABC print!! Oh my gosh... I have been looking for a growth chart for my son for a year but hadn't found one that I liked! The "On the Go" growth chart is PERFECT for my son's new "big boy" room! I love the alphabet sign, it is so cute! Lovely giveaway! I love the girly frame! What a great giveaway! and a new growth chart in my daughters room would be so great! I'm really digging the alphabet print! It would look great in our reading nook! Awesome products! wow, I would LOVE a growth chart! How cute, and I love the color scheme. Those growth charts are cute and the alphabet print is darling. So cute! I love the growth charts! Everything is so adorable. I wouldn't be able to choose. adorable! i love the alphabet print. thanks for the giveaway! Growth charts are super cute! I absolutely love the abcs and animals - its so cute! They have some really cute stuff!! These are such great prints. So cute and fun. Would love a growth chart for my little boys!! Adorable! I love the personalized art. Thanks for this wonderful giveaway, this would be great in our house!!! eek! I love the alphabet print! My daughter would love it in her room! Thank you! Adorable! So many cute ideas. Beautiful things! I would love some for my house. Too Cute! Love the alphabet poster. So cute! Want that transportation growth chart! These are adorable! Perfect for my boys or to give as a gift! So cute! And you're right these would make great gifts. SO cute! Hope I win!! Super cute!! I love the growth charts!! Absolutely love this store - any personalized like this is amazing!!! These look super cute, I've been looking for a cute growth chart that I would actually WANT to hang in my house! Thanks for the chance! Thanks for introducing us to Petite Lemon. Love it. Thanks for the chance to win. Oh my gosh -- I LOVE that first alphabet/animal print! So, so cute. And what a lovely giveaway -- thanks, Petite Lemon! Oh my goodness! Those would look adorable in either of my girls' rooms! Adorable stuff! Would be lovely to decorate my girl's room with! Wow! Everything is so adorable!!! Those growth charts so adorable! The growth chart Hayden is so beautiful! LIKE! These things are so cute! Thanks for the opportunity. Such precious things! All the products are adorable , it would be hard to choose! I've been looking for a cute growth chart for my little ones! So fun! LOVE THE ALPHABET ONE. Would be perfect for my 4 month old daughter!!! Thanks for the opportunity, I love your blog. I love the alphabet print!! It's all so adorable!! Love the growth chart, My baby just turned one and is growing like a weed, this would be fun to have! The ABC print is the cutest! Especially for a 'nature' themed room. What cute things. I liked the ABC print. Sweet! I would love to win this for my friend who is adopting their first baby! It would make the baby's room extra special! What a great shop! Thanks for introducing it to me! They have so much cute stuff! I would love to win. Such a great site! Thanks for sharing!! I want a growth chart so bad for my kids. We've always been renters and haven't been able to write our kids heights on a wall somewhere so I long for a hangable chart. These are so cute! I LOVE the growth charts!!! I love the Alphabet picture! I am beginning to redo my grand-babies play room and this would be perfect!! 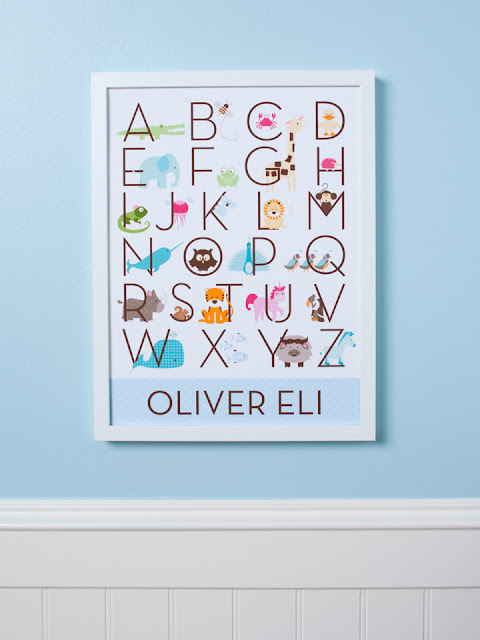 The alphabet print is adorable! Thanks for the great giveaway! I'm getting ready to redecorate my little girls' room, and these growth charts and alphabet posters are so cute and would go so well! Love it! Very cute. Thanks for the chance. I have been looking around for a growth chart... so cute. One of my besties is having a baby and I'm heading to a shower for her in a couple weeks. I LOVE the growth charts! It was just last week that I realized I don't have a growth chart for my 2 year-old daughter. These are adorable! Oh, I have been looking for a growth chart for my baby girl! (She is already 1, I am slacking!) These are so adorable! 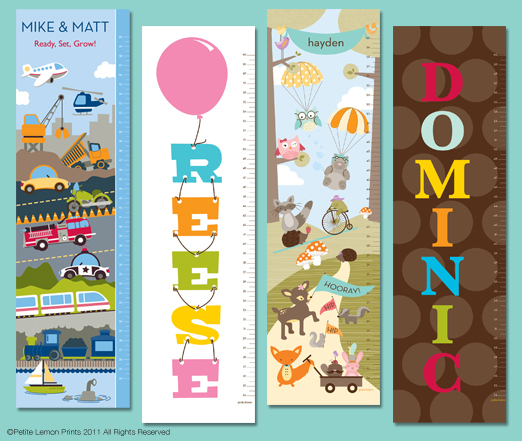 But I would have a hard time choosing between one of those cute growth charts, or that great alphabet print! I love the growth charts! So precious. My daughter loves anything pink with her name on it! These are adorable!! these are so darling and I would love a growth chart for my 2 year old! That would be so fun to win a prize from their store! The Alphabet Chart is so adorable! Those growth charts are so cute! Love love love the growth charts!!! Would love to win!!!! Those are beautiful products! Love the alphabet sign! I love their graphics they're adorable! They are all so lovely! But my favourite is the alphabet print, it would be great to win one. I LOVE these!! I'll be ordering 2 of these in the very near future!! It's my first time commenting on your blog, but I'm a big fan. It would be nice to have one of those growth charts. They look awesome and thanks for the opportunity to be able to win something. Such cute stuff!! Thanks for the giveaway! Very cute stuff! Would love a chance to win to get a growth chart! Thanks! Why can't more things be this cute?!? I've been drooling over their prints forever now! I would love to win one! Beautiful things ... I would love to win the gift certificate, and would have a hard time choosing what to gt! Tooo many cute things! I LOVE the ABC poster! love the alphabet poster! darling! Love the alphabet posters! Super cute. How adorable! I really like the photo posters and the alphabets! Such cute gifts. I'd love a personalised abc for my son's room. 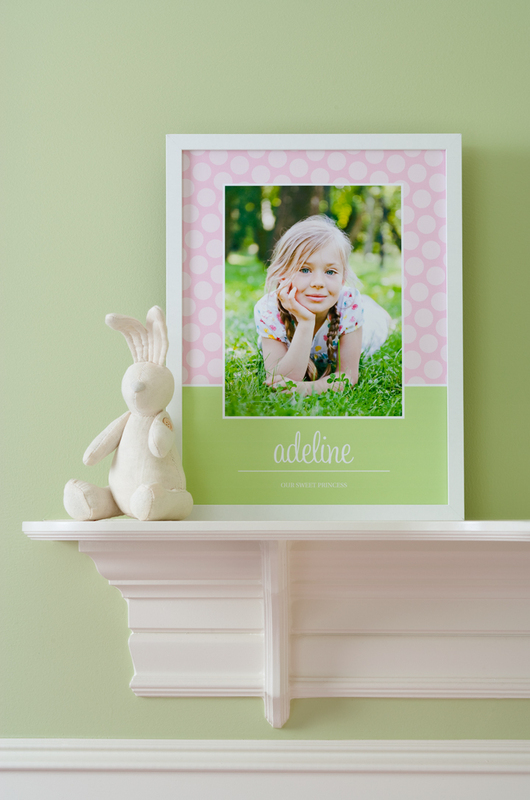 Oh, these prints and growth charts are so cute! Sign me up!! Would look so cute in my kiddos room! LOVE the ABC's frame. Need it! Oh how I would love these for my kiddos who are growing way to fast for my liking! I have wanted a growth chart for so long fornall mynchildren. Thanks! cute growth charts. I really should start doing one of these. So fun! Love their designs. those are so cute! I'd love to have a growth chart for my kids. How cute! I LOVE the ABC charts! I would really like to have some awesome decorations for my kids to put in their spaces. They all have unusual names so we can't find them at the box stores. :) What a great giveaway! so cute. I am going to be moving my kids bedroom around soon so it would be fun to add something new to it. Cute! I'd love to have a growth chart for my little guy. I love the growth chart!!! I hope I win! Those growth charts are adorable! Those prints really are adorable, especially the alphabet charts! their stuff is absolutely precious! thanks for hosting this giveaway! That is some cute stuff! I think a growth chart would make a great present for my mom. My parents just bought a house in my town, after living 2,000 miles away, so I think my mom would love a growth chart. My grandma has one in her house, and it's such a fun thing to look back at. Ooh... I am currently staring at empty walls in a soon to be nursery.. of a "gender left surprise" baby to be born anytime! I could use something this perfect for that room! I just love those growth charts! I love these prints! The growth charts are especially cute! The alphabet is soooo stinkin' cute! Oh, all of it is! It would be hard to choose! those growth charts are super cute! How cute! I want! I want!